Habits of Highly 66 Habits Productive Agents Productive In a business that can be constant chaos, you’re In a business that can be constant chaos, you’re constantly on the go and dealing with things as constantly on the go and dealing with things as they hit you. It can be difficult to take a second they hit you. It can be difficult to take a second and regroup. But there is a better and smarter and regroup. But there is a better and smarter way to work. If you take the time to create some way to work. If you take the time to create some better habits, in the end, you may end up being better habits, in the end, you may end up being more productive. If you want to make better use more productive. If you want to make better use of your time, as well as have more focus, here’s of your time, as well as have more focus, here’s some habits that you’re going to want to pick some habits that you’re going to want to pick up - all common to top-producing agents. 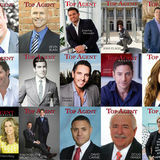 up - all common to top-producing agents. well. Treat your time with the same respect you would a colleague’s or client’s and don’t ever waste it. As with anyone, your time is your most valuable commodity and should be used wisely. When you make your list you can even schedule tasks as if they were a meeting, giving yourself a little time goal to beat, as well. Treat your time with the same respect you would a colleague’s or client’s, and don’t ever waste it. to accomplish it? Write it out and then incorporate that into your prioritized ‘to do’ list. You’ll be amazed at how driven you become to reach that goal when you actually write it out with clarity. And, the sense of accomplishment you get upon completing it will carry over to the next day. It’s important to remember to be specific. Once you get into the habit of meeting your goals, exceeding them won’t be far behind. when you need to focus This is especially hard when you’re a Realtor®. Most are constantly connected to their phones. But, unnecessary distractions can get you off schedule and make you lose your focus instantly. If you can, turn your phone off for the half hour it takes to do a task. Interruptions make everything take twice as long, especially when you take that text and then decide to check Facebook for a second. We all do it! Complete your task, then take ten minutes to respond to all texts and messages before you start up the next thing on your list. You can even schedule those ‘text backs’ into your schedule. A concentrated effort is always more effective than going back and forth between things. tive ways to stand out when times are tough. They don’t look for excuses, they look for solutions. about everything you do When you’re making your list, it helps to have a goal in mind for even the smallest task. If you’re calling past clients to touch base, have a specific reason why you’re calling. Are you letting them know some market news? Thanking them for a referral? When you’re meeting a referral partner for lunch, have a goal in mind for what the outcome of that meeting will be as well. Yes it’s good to socialize and build relationships, but if you have a reason, make sure it isn’t put off until the final moments, when things are wrapping up. Always having a purpose in mind will also help you prioritize your list better. 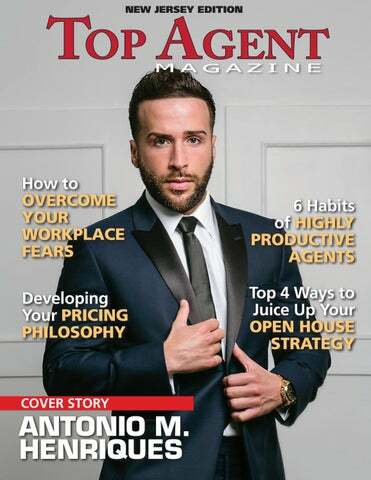 To learn more about ANTONIO M. HENRIQUES, visit: SignatureRealtyNJ.com, www. hear a dozen different approaches. And if the talk reveals frank responses, you’ll also learn that the most common pricing strategy is no strategy at all. Here’s my advice: Break out of the ranks by establishing and following a specific strategy for arriving at the ideal selling price for each home. Adopt the philosophy that, in real estate sales, price is king. Price trumps all other factors—including marketing approaches, home condition, market competitiveness, and sales approach. I believe that, in the end, marketing and condition of the property are controlled by the price. The alternative, advocated by many agents, most sellers, and even some sales trainers, is to emphasize marketing over pricing. Rather than working to set the ideal price, they believe success will come from optimizing the home’s condition and presentation and then marketing it with skill and savvy. to seal a deal erodes the likelihood of selling the property. To gain a seller’s nod of approval, the agent makes a flatteringly high pricing recommendation, throwing out a number the client wants to hear and then hoping something good will result from the bad situation. I can think of few examples, if any, where this philosophy works. Hope isn’t a successful pricing strategy. Worse, the please-the-client mindset is a hard one to abandon. Agents who achieve listings with unrealistic prices find it hard to later counsel their clients honestly. As time goes on, you’ll devote more and more time unsuccessfully trying to create a sale not only for your seller but also for yourself. This will pull you away from activities that are more likely to deliver income. The ensuing frustration will de-motivate you and stunt your ability to secure better appointments that create other income opportunities. An unsold, overpriced listing negatively impacts your profitability because it costs you time and money to service while it delivers no revenue to your business. And the situation only gets worse the longer the listing languishes on the market. You’ll end up deducting the expenses of this in-limbo listing from the proceeds generated by any revenue-producing deals you manage to close in the meantime, reducing your net profit and business success. Unsold homes that linger on the market seriously diminish your salability, which is the term that describes your sales success track. Your salability is based on such key statistics as your average ratio of listing price compared to sale price and the average number of days your listings are on the market. Obviously, these statistics, which prospects rely on when choosing one agent over another, can be crushed by a “get the listings at any cost” philosophy. They’re also harmed by the “start high and reduce later” tactic. If you take and price a good listing competitively, it will sell. You can’t keep a good price a secret! Dirk Zeller is an Agent, an Investor, and the President and CEO of Real Estate Champions. Copyright© 2014, Dirk Zeller. All rights reserved. I go to open houses, but not just because of my profession or interest in architecture and interior design. I go to open houses to see how effective real estate agents are at selling. It has been rather eyeopening because there is very little selling going on—the average open house strategy needs work. 1.Build a Dynamic Open House Booklet After they leave, open house visitors will discard a one-page for-sale info sheet naming a home’s features. But they will keep, and possibly use, a 6 or 8 page booklet loaded with interesting items that directly solve problems for them. Perhaps “selling” is considered an outdated skill, or that it feels socially awkward for agents to be regarded as a salesperson. But if you’re a real estate agent, you are a salesperson. At most of the open houses I go, I see money floating out the door every time a visitor leaves because of the agent’s inability or refusal to sell. It will require some strategic thought to nail the content and design, but perhaps include: (i) descriptives about the benefits of buying the property you’re showing, and not just data, (ii) compelling reasons why they should consider working with you along with a web link to search for listings on your website, (iii) a web link telling them how to get a prompt, written estimate on the value of their home, or to find out what other homes in their neighborhood sold for, (iv) possible discounts on real estate related services—maybe a reduction in fees from your preferred lender, or a reduced home inspection price, (v) possible discounts on non real estate related items. If you combine this dynamic booklet with properly trained closing language, as touched upon below, it is something the average person will either keep and use or pass along to someone they know. A well designed booklet can bring you a lot of business. data—and they are void of interesting or problem-solving information. 2.Work The Neighborhood A few days prior to your open house, find the names and addresses (from tax records—or elsewhere) of, say, 20 homes in each direction from the Pre-internet, both open houses for open house. resale listings, and model homes for new construction, relied on strategic For the cost of postage and some collateral materials (handouts). Vis- sweat-equity, mail a postcard to these itors were ostensibly looking at sev- 80 homeowners inviting them to the eral competitors at the same time, so open house and offering something collateral materials had to have the unique and compelling—perhaps a power to bring them back to your drawing or giveaway for those willing site—a great call to action, eye- to provide their opinion on the asking catching color, identification of the price of the home (and the entry card, of course, will net you their email benefits of buying your product. address and phone number). People Yet at open houses today, I primarily are generally nosy and like to be see bland information sheets dis- validated, so asking for their opinion cussing features—the listing price, on something happening in their own the square footage, and the standard neighborhood is very appealing. 4.Have Interactive Tech Tools Onsite It is the worst feeling to engage someone as a potential client at an open house and then have no tools available to solve their problem— don’t assume they aren’t going to want to do business right away. If you’re engaging a potential buyer, you better be able to instantly gratify their desire to see viable homes online so internet access and an easily view-able screen are necessary. They may ask you to go see other homes in-person, so you need to have a coagent available to either show them those homes, or spell you off as host while you do. You may be asked to write up an offer for them so you will need the tools and ability to create and e-sign documents. How To Overcome Your Workplace Fears Fear is something that can help protect us from danger, but it is also something that can be a hindrance to us in our lives, especially when it keeps us from potentially thriving and growing as a person. This is especially true in the workplace. Here is a look at some proven ways to overcome common workplace fears. your head, what exactly you’re feeling and why, it can help deflate the fear. Think of it as releasing some of the fear into the ether. Yes, you’ll still be nervous about your presentation, but a lot of what was holding you back is gone. You’ll feel lighter, and hopefully have just enough butterflies to make your soar. it doesn’t, and you might be surprised to find out that some people have had it even worse. Talking to someone you trust and admire, hearing their own fear horror stories and how they overcame them, will help normalize what you’re feeling. Releasing yourself from the idea that it’s something about you, will be an enormous relief. Although it might seem counter-productive, truly assessing what the worse outcome of the situation you’re afraid of serves two purposes. It might lead you to realize the worst case scenario isn’t that bad after all. Of course it could also lead you to a really uncomfortable thought, you could lose your job. As bad as that is, it also gives you an opportunity to start focusing on what really matters, and how you might grow from the experience and possibly end up better off. Countless people in their dream jobs now, were once fired and thought it was the end of the world. Hopefully, that won’t happen to you, but learning to have confidence in your abilities to always find a way, will be a great tool in overcoming fears. Start thinking of fears as challenges. As scary as it might seem to face them, for the most part they are things that can be fixed. you’re taking in your fears and figuring out ways to overcome them. Start thinking of fears as challenges. As scary as it might seem to face them, for the most part they are things that can be fixed. A lot of fear is based on inexperience which leads to a lack of confidence. A common fear is workplace evaluations. Instead of looking at it as hearing everything that is wrong about you, think of it as an opportunity to see where you can improve. Going into it with a positive attitude rather than a defensive posture, will make the whole thing better for both parties. Overcoming fears is oftentimes about a simple attitude adjustment. Like anything it takes practice, but the results of that practice will lead to a life that you’re able to thrive in both personally and professionally.